The Savoy Hotel has announced it will finally reopen its doors on 10 October this year, having been closed for refurbishment for almost three years. Once open the Fairmont-managed hotel will feature 268 bedrooms and suites, with Edwardian and Art Deco interiors designed by Pierre Yves Rochon, plus the addition of a new two-bedroom Royal Suite and 38 River Suites with views of the Thames. The hotel’s River Restaurant, which previously served only breakfast and Sunday brunch, has been completely remodelled and will offer lunch and dinner once open. The Savoy reopening will also see the launch of the Art Deco Beaufort Bar, which will serve Champagne and cocktails, as well as Savoy Tea, a bijou teashop selling Savoy tea and fresh patisserie. Also reopening along with the hotel will be Gordon Ramsay Holdings’ Savoy Grill, led by chef patron Stuart Gillies and head chef Andy Cook, which will incorporates a private dining room for 50 covers plus a chef’s table situated in the kitchen. In an interview with Restaurant magazine, Gordon Ramsay said he intended to revisit the famous Georges Escoffier menu and reinvent it for the Savoy Grill. “The Savoy Grill is one of the most significant dining rooms of London, with an incredible heritage,” he said. “My inspiration is going to be Escoffier, who had such a fundamental influence on restaurant dining in this country and who has been out of fashion in recent times. We will rework many of his classic dishes as well as creating brand new dishes inspired by his style and technique. “I was incredibly proud to have won the first Michelin star for the Grill in 2004 and am looking forward to turning the page of history again and creating the next incarnation of this incredible restaurant. Also returning to The Savoy will be the glass-domed winter garden gazebo, in which the hotel will serve afternoon tea. A glass enclosed fitness suite plus rooftop swimming pool – one of a few in the city – will also be introduced. 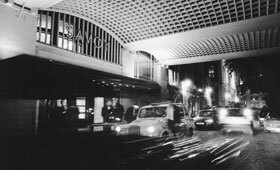 Please note the Savoy is not currently a DR club property and membership benefits do not apply.